If you have been in the lead generation business for a while, your CRM is probably your BFF and you count on it to convert more and more new customers. But not knowing all the marketing channels/touchpoints that lead new customers to enter your CRM can be a costly blindspot. Ideally, you want to be able to quantify how much each digital marketing channel contributed to customers converting and entering your CRM. And with a quick hack, you can send and store that information into your CRM directly when customers convert, and avoid the pain of cross-matching your CRM’s customer IDs or email addresses with your Analytics data (if everything is well tracked that is). This is where Marketing Analytics meets Web Analytics. Marketing Analytics goes beyond the Web in the sense that it tracks as much data as possible from customers’ touchpoints (both online and offline) in order to analyze marketing performance and optimize return on investment (ROI) across all channels. How to capture traffic referral information in a browser, store it in cookies, and pass it to your CRM. How the traffic source data can look like in the CRM of a particular customer profile. Analysis and optimizations you can get out of this traffic sources import. Note that understanding this blog post does not require a lot technical savviness, but you are likely to need a developer with knowledge of your backend systems in order to implement these solutions successfully. 1) How to capture traffic referral information and send it to a CRM? Store all the referrers of a visitor. So if the referrer of the first visit of a user is Google Organic, the second is Facebook, and the third is Adwords, all these three referrers will be stored in a cookie. 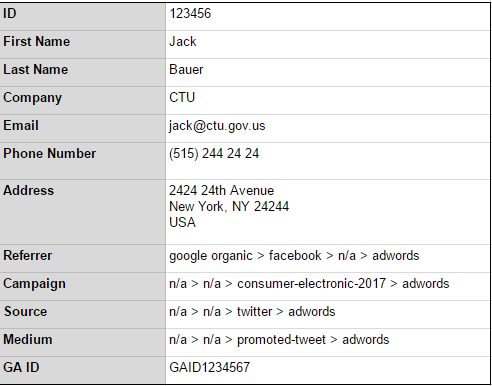 Read Google Analytics’ UTM parameters and identify marketing campaigns you have tagged. Store the visit time spent and number of pages viewed. Optionally, you can also create 2 extra fields to store the time spent per visit and number of pages viewed. In order to pull the _reff cookie’s values (information), you should start by reading the “Possible _reff values” section on this page. The Referrer field above will contain different refers from multiple visits. Each visit/sessions is separated by a pipe sign (|). It is important to store the referrer of each visit whenever there are multiple visits from the same user. You can keep the pipe sign (|) to separate each visit or another sign that suits you better. If storing the time spent per visit and number of pageviews is not important for you, you can simply strip off the visit details (the numbers that follow the “&” sign) before you store it into your CRM. Note that the Source, Medium, and Campaign fields above will only be filled whenever the “c” (campaign), “m” (medium), and “s” (source) are present in the _reff cookie, or when the landing page’s URL is tagged with UTM parameters. So you can ask your developer to leave these 3 fields empty or with “N/A” in your CRM for users who do not land on the site via UTM tagged URLs. Below is a few conversion use cases where the 4 fields could be automatically filled in your CRM. When it comes to users that complete more than one of the steps described above in different sessions, you will have to think about how it would be best for you to deal with these uses cases. For example, if the same user signs up to the newsletters on Day 1 and then buys a product on Day 3, should the _reff values from Day 1 be overwritten by those from Day 3? Or should you store the reff values of all sessions and use a specific separator to separate the first session from the second, third…etc.? The answer to these questions really depends on the flexibility of your CRM. Keep in mind that for cases where the same user deletes his/her cookies or changes his/her device on a subsequent visit, the initial visit’s referrer in the _reff cookie will disappear. So you will probably end up with one referrer, the one from the last visit/session before converting. Along with the 4 fields that should be created in the CRM database, a fifth field for the “CID” should also be created ideally. The “CID” is the client id that Google Analytics randomly generates for every user that visits a website. This is how GA identifies unique users (by attributing them a unique random number). You can find the client id (CID) in the cookie named _ga. Make sure that the “CID” is sent to the CRM database whenever the 4 steps above take place. Storing the CID can help you identify your customers and what they do on your site. You can even use it to track and analyze which user opens your newsletters in GA reports. Third visit/session: UTM tagged campaign on Twitter. Of course, this is one way of visualizing those 5 fields. Feel free to be more creative and to adapt it to your needs. On average, how many touchpoints did it take for your customers to convert (subscribe to your newsletters, purchase a product, fill a contact form, download your app…etc.)? Yes, it’s a bit like the Multi-Channel Funnels reports in GA. Which channel tends to be the first touch and which one tends to close the sale (last touch)? Who are your most profitable customers? Doing some cross-analysis with LTVs (lifetime value) data, you can find out the traffic sources of your most profitable customers. Maybe they came from that expensive native ad you bought on the New York Times? Now you know to buy more of those ads. What is the best channel I can use to reach specific customers in an upsell campaign? Yes, I know you can already do these types of analysis in analytics tools like Google Analytics, but the difference here is that instead of analyzing unidentified users (#GA), you have the ability to know exactly which channels assisted and converted each one of your customers, and that’s a big plus. Voilà, now you know you don’t have to rely on your analytics tool to find out where your customers came from. You can have this data right in your CRM with just a bit geekiness. Have you ever tried it? If so, please share your experience in the comments below. Any questions are also welcomed! Loïc has worked in the Web industry for over 8 years. He specializes in Google Analytics performance measurement tools, SEM campaign optimization, the conception of measurement architectures, and in the creation of A/B tests.